Online outlet for the largest selection of Wedding Decorations ranging from cake toppers, centerpieces, veils and a wide variety of other wedding accessories. When planning and preparing for that special day, one of the most important things on the bride-to-be’s mind will be the wedding decorations. There are many important details to consider before decisions can be made in this stage of the planning process. 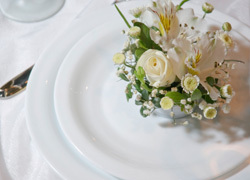 A good place to start is to decide whether the wedding will have a specific theme, and if so, what will it be? Many couples choose a theme based on a special city or romantic location, a time period, a significant family tradition, a shared hobby or interest, or a religious custom. Others will choose themes that are based on current trends. High-profile celebrity weddings, as well as wedding magazines, are also popular places for couples to find the perfect theme for their big day. Once the happy couple has agreed on a theme, the focus of the planning becomes much easier. The next step is to consider decorations for the event that will allow the couple to develop the theme so that others will realize it. Wedding decorations are available to correlate with the chosen theme, allowing the couple to completely transform the wedding venue, all the while captivating their guests. Examples of wedding decorations may include personalized napkins, place holders, favors for guests and members of the wedding party, ribbons and bows, floral greenery, cake toppers, centerpieces, candles, balloons, confetti, baskets, vases, and a myriad of other items a couple may use to personalize their day. Some weddings are not theme-based, but instead planned with a certain color theme in mind. Again, once the colors are chosen, the planning is simplified. Decorations are purchased to coordinate around the colors of the wedding. Often, the bridal party’s dresses and tuxes will include the main color and the flowers in the wedding will include the accent color. Ribbons and bows on the pews may also accentuate the color scheme. It is also somewhat traditional for the mothers and grandmothers of the happy couple to wear these colors. The wedding decorations used at the reception should also represent the chosen colors. Many couples will choose napkins, table cloths, plates, cake toppers, centerpieces, candles, balloons, flowers, and cups that reflect the hues, thus allowing the atmosphere and design from the ceremony to flow into the reception area. In the reception area, guests often find that the color theme is also included on the wedding cake and may even be reflected in the color of the punch. There are still other couples who elect not to choose a theme or a color, but plan their wedding and decorations around a particular design such as the couple’s last name or monogrammed initials. Whatever the design, this is usually something that is extremely special to the bride and groom and usually plays a role in defining who they are as a couple. In the example of the monogrammed initials, the couple’s insignia may appear on decorations such as napkins, placeholders, announcements, tableware, and even on the wedding cake. Some couples choose to use replicas of wedding rings to decorate their wedding. The design often appears on everything from invitations to decorations to wedding cakes. Examples would include napkin rings that resemble wedding rings, matchbooks or balloons that are printed with wedding rings on the outside, cake toppers that represent wedding rings, and even miniature wedding rings tied together with pretty ribbon can be used as decorative accents to the centerpieces on the tables in the reception hall. Whether a couple chooses a theme, color scheme, design or a combination of the three, selecting the perfect decorations for the wedding plays a crucial role in tying it all together in a way that allows the happy couple to share their dream wedding with those attending. The decorations are often one of the most talked about components of a wedding, second only to the bride herself. Guests will leave with memories of the decorations used in the wedding. Many will even describe the wedding to others by solely discussing the beautiful decorations that were selected and how they were used. Give your guests wonderful things to talk about. Make sure your special day is perfect by including the perfect wedding decorations as part of your dream wedding. © Copyright 2011 WeddingOutlet.com. All rights reserved.